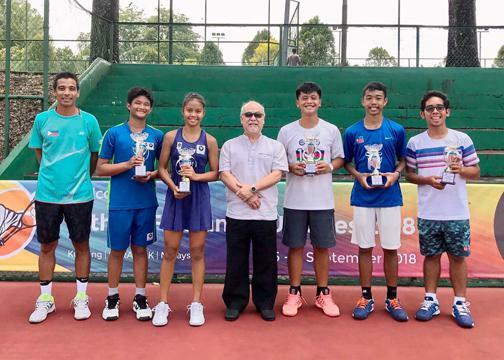 Junior tennis players from the Philippines continued to dominate regional competitions as the Unified Tennis Philippines Juniors National Tennis Team showed exemplary performance at the recent 13th Asian Tennis Federation tournament held in Sarawak, Malaysia. Shown in photo are (from left) Coach Roland Kraut, John David Velez (Boys’ Singles Champion and Boys’ Doubles Runner-Up), Alexa Milliam (Girls’ Singles and Girls’ Doubles Champion), SLTA President Patrick Liew, Brent Signmond Cortes (Boys’ Doubles Champion, fifth place Singles), Rupert Tortal (Boys’ Singles Runner-Up and Boys’ Doubles Champion) and Rainier Selmar (Boys’ Doubles Runner-Up, 6th Place Singles). John David Velez and Alexa Milliam dominated the Boys’ and Girls’ Singles Under 14 category, respectively. Velez defeated Rupert Tort, also from the Philippines, 6-1, 5-7 and 6-1; while Alexa Milliam defeated Malaysia’s Lim Lim Zan Ning, 6-3, 5-7, 6-1, to emerge on top of the competition. A day earlier, Rupert Tortal and Brent Signmond Cortes won the championships for the Boys Doubles, while John David Velez and Rainier Selmar were runners-up. Meanwhile, Alexa Milliam also brought home the championships trophy for the Girls’ Doubles. Jean Henri Lhuillier, president and founder of UTP expressed elation upon hearing the good news from Sarawak. “I’d like to congratulate the team for the great performance they have showed at the ATF tourney in Malaysia. They have dominated the competition and proved just how talented and dedicated they are. More than that, they showed great potential—delivering a message to our friends in Asia that they are the players to look out for the years to come,” Lhuillier said. “I have always believed that Philippine tennis has so much potential—and that the way to deliver champions is to make the game more inclusive, develop and scout for young Filipino talents, no matter where they may come from and have a solid grassroots program that will hone the skills of upcoming talents. The fact that our juniors’ national team has been doing so well in three straight international tournaments is a testament to that,” he added. Prior to be being part of the UTP Juniors National Tennis Team and clinching their victory in Sarawak, all five members saw action in various tennis grassroots programs, most notably the annual Cebuana Lhuillier Age group tennis tourney, as well as other junior circuits by other companies. Committed to their vision to discover fresh talents, UTP continues to spearhead more than a hundred age-group tennis tournaments nationwide. This was made possible through the thanks to the support of the likes Cebuana Lhuillier, Palawan Pawnshop, Babolat, HEAD, Chris’ Sports, Dunlop, Toby’s Sports, Wilson and Decathlon, among others. Up next in the UTP calendar is the upcoming Cebuana Lhuillier Girls’ Tennis Challenge, where the champions will represent the country in the WTA Future Stars in Singapore in October.